A few months after blooming, an orchid loses its flowers, the leaves droop and the stalk will dry up. It will appear that the plant is ready for the trash and has no life left in it. But you would be mistaken. Orchids do not die after blooming. They actually enter a stage of natural dormancy to allow the plant to rest. They need to replenish their energy for the next flowering phase. By continuing to water and fertilize your orchid, it should only take a couple of months and a new stalk will develop. For an orchid to re-bloom, re-pot it into a clean container and verify that you are using the proper potting medium. If you are using bark the rule of thumb is; “the finer the roots, the finer the bark”. Phalaenopsis or Cattleya orchids require a rough, uneven bark while Oncidiums and Miltonias fair better with a smooth bark. Because orchids grow roots only a couple of time a year, the timing of the re-potting is important. When you see a new leaf growth during dormancy, it is time to re-pot the orchid. Observe the roots and if they are whitish in color and are firm to the touch, they are healthy. If the roots are soggy and soft, they need to be removed before re-potting. Make sure the bark is moist in the container and pack it around the roots to secure the orchid. Re-potted orchids should stay out of direct sunlight and should be watered only if the potting material is slightly dry. 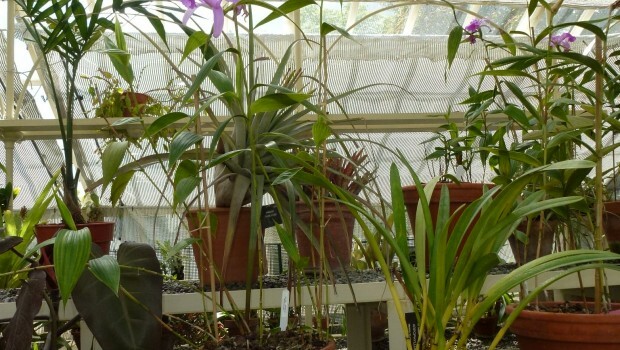 If you are growing orchids in your greenhouse, you may have to use shade cloth to prevent plants from getting scorched from direct sunlight. Polycarbonate glazing is better than glass at keeping plants shaded. Over-watering an orchid will kill it. More people kill their orchids from what they think are “acts of kindness” than anything else. Do not over-water or fertilize too often. Fertilize every two weeks during the growing season and once a week in the winter. Orchids also need to be re-potted after its second blooming. If you notice it has been a long time since the last blooming, it is an indication that the plant needs to be re-potted. After an orchid is finished blooming in a particular cycle, check the old flower stalk. If you see a node which looks like a little scar, look right under it for a small bump. This is a bud with the potential to grow into a new flower spike. At this point you can cut the old one off. Remember that an orchid will be encouraged to bloom sooner if it is kept in cooler temperatures year round. 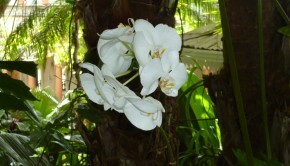 Most orchids do not do well in high temperatures. Because there are thousands of orchid species, it is best to look up the particular orchid that you are growing for optimum care.